Melt butter in a large skillet over medium-high heat until it sizzles. 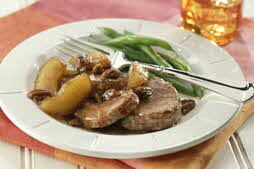 Arrange pork slices in skillet. Cook for 2 minutes; turn slices. Sprinkle with brown sugar and pecans. Cover and cook for 4 to 6 minutes more. This quick dinner from Ann Council is perfect for a fall week night. Serve with steamed grean beans and a crusty bread.